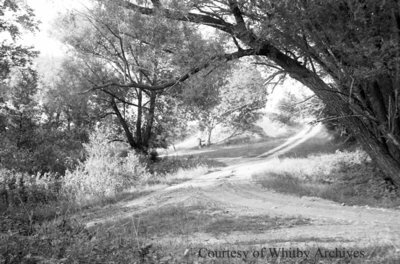 A black and white negative of an intersection of two roads in a valley known as the Devil's Den in Whitby, Ontario. On the negative envelope Marjorie refers to this intersection as the "Four Corners". Devil's Den, August 1, 1938, Marjorie Ruddy. Whitby Archives A2013_040_759C.